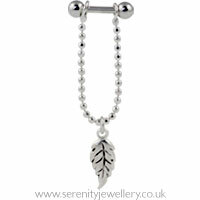 9mm sterling silver leaf hanging on a chain with a 6mm, 8mm or 9mm surgical steel barbell using 3mm screw-on ball closure. Bar length Cartilage studs are not adjustable so you need to choose the length of the bar. I love this earring as the chain and leaf are so cute and adds a new level to your outfit! Have to take it out every now and then as it has caused a little irritation but that dies down very quickly! I'm sorry to hear that. Fortunately the earrings with the chain design can be used with any 1.2mm (smaller) gauge barbell so hopefully you'll still be able to wear if you just change it to a longer bar. This looks really lovely once it is in, but I think I should have got the longer bar to make it a bit easier to fit. Very pretty and worth the effort. Birthday present and the feedback was she loves the design. Quite fiddly but worth it. Not really for me as my helix piercing is quite low down, still nice! I really like it. I have accidentally fallen asleep with it on, which goes to show its quite comfortable to wear. This looks really nice but it's quite fiddly to get on. You really need to have someone to put it in for you. A really great product but a little tricky to secure in! A great product! It looks really pretty and hangs nicely from my top cartilage piercing. The only negative about this earring is that I found it quite tricky to get in as the chain itself is not attached to the bar. Otherwise, I love it!